Delcam will demonstrate its range of software and services for the jewellery industry at the BaselWorld exhibition to be held in Basel from 26th March to 2nd April, including the latest version of its ArtCAM JewelSmith CADCAM software and its new online a rapid prototyping bureau service, rp.delcam.com. ArtCAM JewelSmith enables jewellers to design and manufacture highly intricate, bespoke jewellery or complete new ranges with ease. Whether modelmakers prefer to draw their designs, hand-sculpt a 3D model or create the piece in a familiar CAD package, their work can simply be scanned or imported directly into the software. 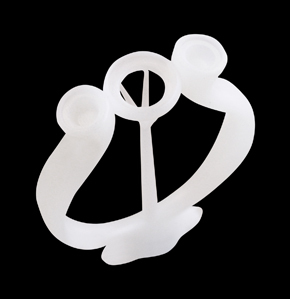 Alternatively, designs can be created directly in ArtCAM JewelSmith. Engineered for its ease of use, ArtCAM’s structure is similar to artistic packages such as Adobe PhotoShop where the jeweller can utilise a number of layers to change elements of their design, or to form intricate and complex patterns. For example, when creating a matching necklace, ring and bracelet, ArtCAM’s ‘Project Tree’ can keep all related models together, for quick reference, accessibility and easy duplication of any design element. To incorporate gems into the jewellery design, JewelSmith quickly and efficiently takes the dimensions of both calibrated and un-calibrated gems, and creates caps to securely hold them in place. This saves the jeweller’s time and allows him to focus his knowledge and skill on developing other design ideas. With JewelSmith 2009, modelmakers can sculpt their designs, either by using ArtCAM’s sculpting toolbox or by customising their own sculpting brushes using imported textures or their own 2D design. For hand engravers, ArtCAM can replicate their current working methods by utilizing a Wacom tablet. With this device, the more pressure applied by the pen to the tablet, the more material can be moulded or manoeuvred into shape. An important new feature for producers of corporate giftware and collector/visitor jewellery is the ‘Embossing Tool’. To create a coin pendant, for example, the user can take a 3D model and tilt or rotate it to give the required perspective, creating the illusion of distance between one area and another. Within seconds the ‘Embossing Tool’ then reduces the model’s depth to those typically used for coinage whilst maintaining the prominent details and illusion of depth from the original model. For companies offering a bureau service, ArtCAM’s latest ‘3D PDF Viewer’ will prove invaluable when seeking customer approval. Rather than taking multiple screenshots or sending large files, users can simply save the 3D View of their model as an accurate and rotatable PDF file that can then be e-mailed to all involved parties. Once the design process is complete, ArtCAM JewelSmith’s integrated machining wizards set the machine toolpaths or provide the necessary output files for CNC machining or rapid prototyping of the piece. For jewellery produced from more than one material, ArtCAM JewelSmith can divide the design into separate files for manufacturing. Companies concerned about the cost of purchasing high quality RP machinery or those preferring to use a rapid prototyping bureau service for model construction will be interested to know that Delcam will also be showing its rapid prototyping service. Delcam’s rp.delcam.com bureau service will be available to anyone wishing to make 3D models for use in the lost wax casting process. Delcam will supply robust castable wax/resins within 48 hours for companies to use either in their own casting process or to supply to any third party casting company. ArtCAM JewelSmith files or any other 3D files can easily be uploaded to the Delcam FTP site for quick quoting and production.